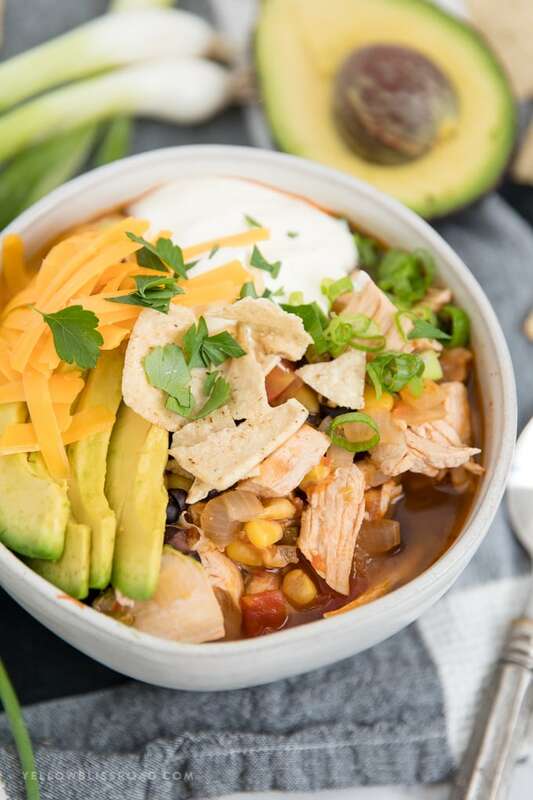 My Chicken Tortilla Soup Recipe is a family favorite and easy go-to meal for busy weeknights. 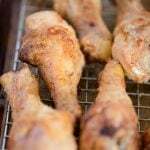 Use up leftover chicken or a grocery store rotisserie to make it ever simpler! 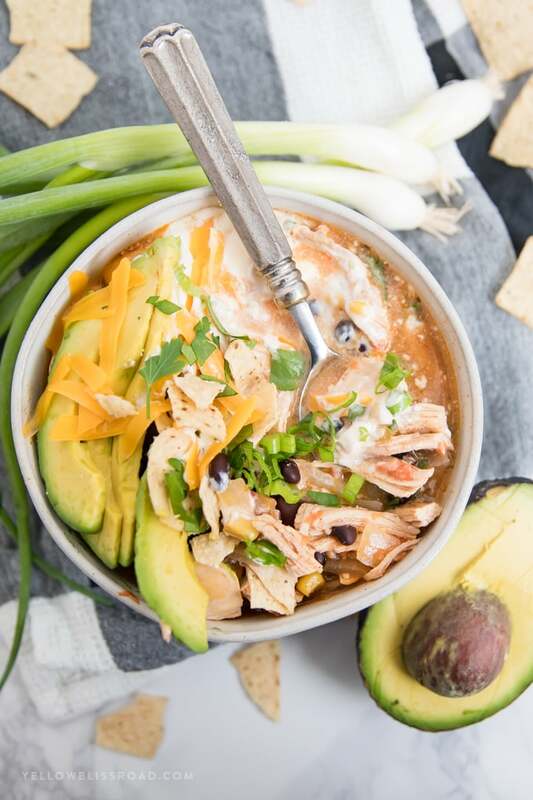 Chicken Tortilla Soup (or sometimes we just call it Taco Soup) is a favorite around our house. Everybody loves it – kids and adults alike! It’s incredibly simple to make, and takes just 30 minutes. You could even cut that down to 20 if you’re using pre-cooked chicken. There are so many delicious flavors in this soup, it’s sure to be a hit with your family, too. 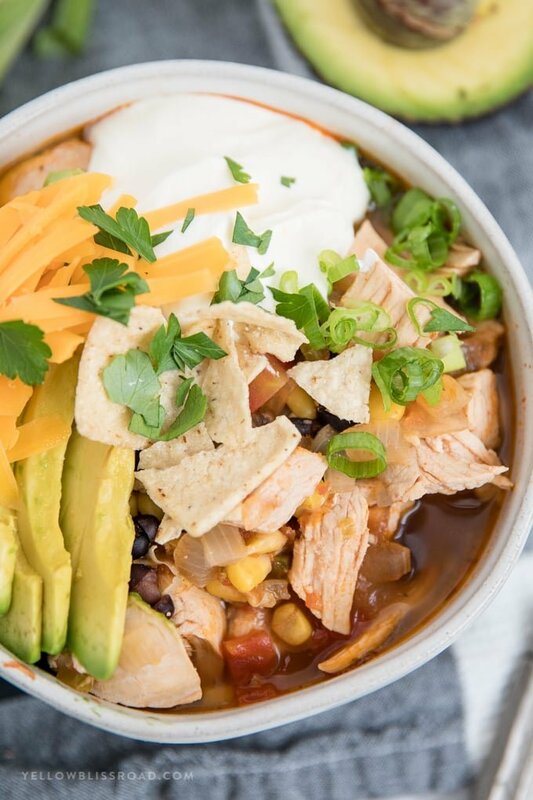 I can whip up a big pot of this Chicken Tortilla Soup and have leftovers because my kids love to take it in their thermoses for school lunches; and it makes their PB&J eating friends super jealous! Soup is one of the easiest meals to make on busy nights because you pretty much just throw a bunch of ingredients into a pot, stir it up and let it simmer. 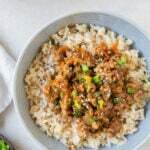 The simmering gives all the flavors a chance to marry and play nice together. 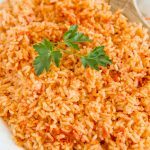 This is a versatile recipe as you can use your favorites – salsa or diced tomatoes? You decide! Pinto beans or black beans? You be the judge! Don’t like corn? Leave it out! Plus you can create a toppings station and add even more ingredients to the bowl, just like on Taco night! 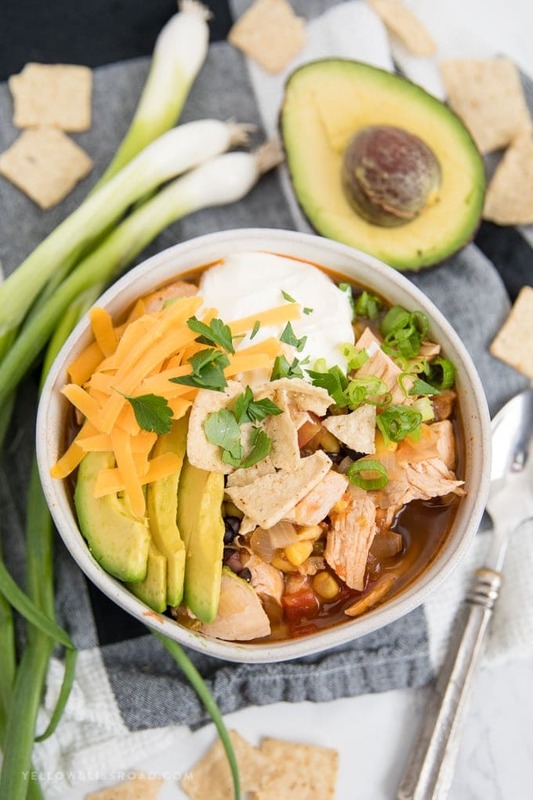 What really makes this soup Chicken “TORTILLA” Soup is of course the tortillas! You can put some cut up corn tortillas right in the bottom of your bowl and they soften and mix with the soup, making it a little more thick, like a stew. Or you can use tortilla chips, and they won’t melt into the soup quite as much. And if you add the chips as a garnish, they add a lovely crunch to all the softer ingredients. What is Chicken Tortilla Soup made of? 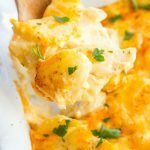 There are some super easy and incredibly delicious ingredients that when combined together create the magical flavors in this soup. Well of course the basis of this recipe is CHICKEN! I use different methods for the chicken. 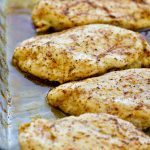 I almost always make a couple extra pieces when I cook my Baked Chicken Breasts, and I always have some Slow Cooker Shredded Chicken on hand. If you don’t have any on hand, pick up a rotisserie chicken from your grocery store. For garnishes we use things like sliced avocado, lime juice, cilantro, sour cream, shredded cheddar cheese and diced tomatoes. 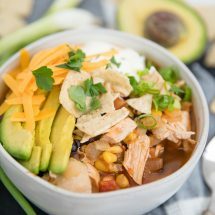 What spices are used in Chicken Tortilla Soup? 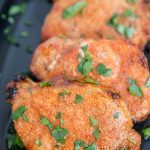 I use my yummy homemade Taco Seasoning, but you can use a pre-mixed from the store (I like this one; aff). The main seasonings you want to include if you’re not using a taco seasoning blend are chili powder and cumin. 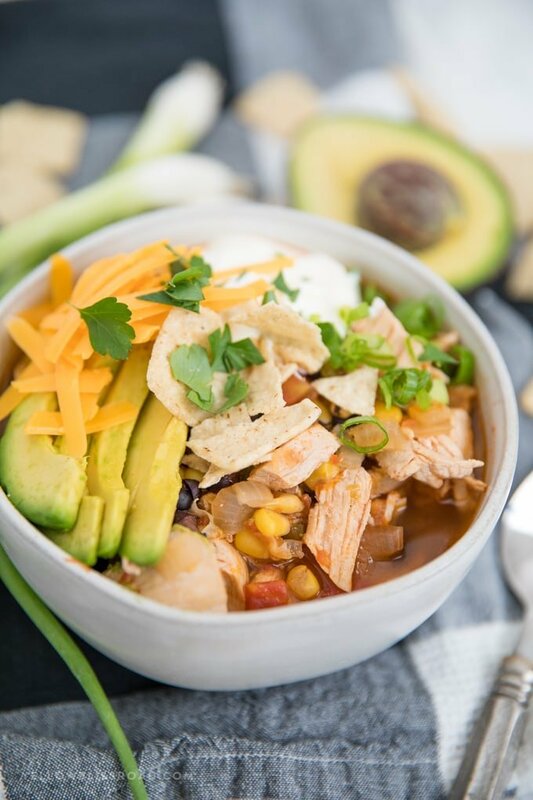 Chicken Tortilla Soup is a family favorite and my go-to dinner for busy weeknights. Flavor packed with chicken and spices, black beans, salsa and more! Heat a large pot with a tablespoon of oil. Add diced onions and cook, stirring often, until translucent and soft; about 3-4 minutes. Stir in garlic and cook 1 minute. Stir in taco seasoning and salt and cook an additional minute. Stir in chicken, corn and black beans, then pour in chicken broth and salsa. Stir and bring to a boil. Reduce heat to low, cover and simmer for 20 minutes. Taste and add salt as desired. Place a small handful of corn tortillas or tortilla chips into the bottoms of the bowls. Pour ladlefuls of soup over the chips in the bowls and top with desired garnishes, like cilantro, sour cream, cheese, avocado, and of course lots tortilla chips! *Nutritional count does not include optional garnishes. This is a really good soup! I will put 2 cans of black beans in next time but other than that, excellent! When do I add in the salsa? Same time as the broth. Oh God, I cant remember the last time I cook tortilla soup .Your post make me really miss its flavor. 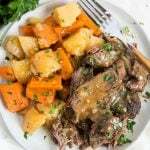 I realise that i really like the way you share your recipe. 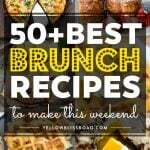 It help me can read and know your tip, your special, your change in every recipe easily.